So I don't want to jinx it because this is a very delicate subject around here but I THINK.... I THINK we may be actually getting warmer weather and Spring may ACTUALLY be here. Maybe. The temperatures have been warmer this week and I am DYING to wear my spring items, pack up my parka and soak in all the vitamin D I have been lacking over the last six months... yes, we are on month six of snow. It needs to go. 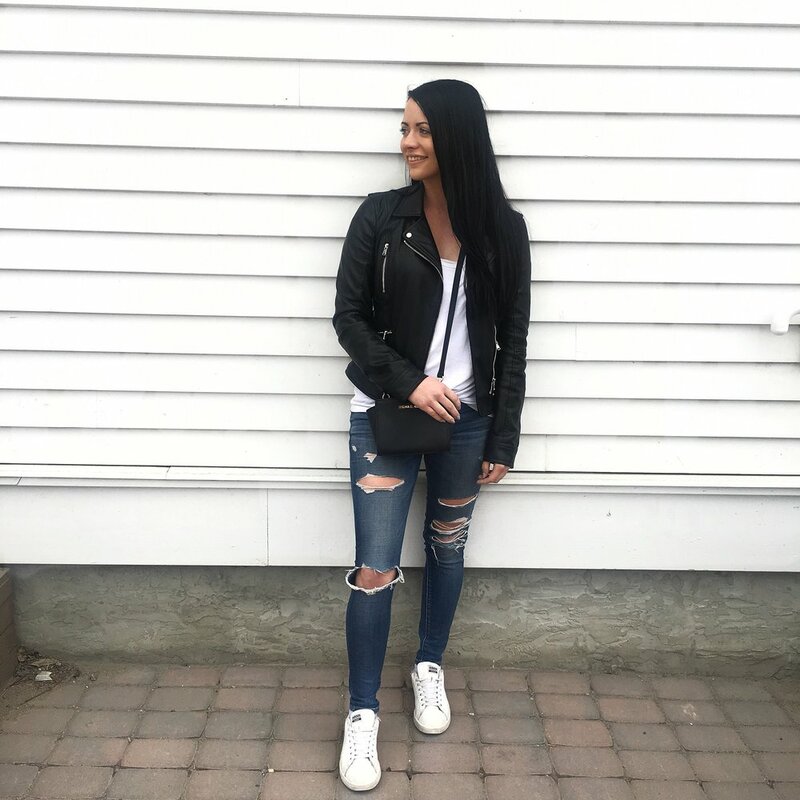 In light of all this, I purchased few new items for spring to pair with items I already had in my closet to put together a few new Spring looks! I will be doing a blog post on how you can use these items to create a capsule seasonal wardrobe so stay tuned for that! I am loving my new suede jacket from Seattle VIS (@seattlevis) that goes with everything and is perfect for Spring! The oversized hardware makes it so unique and it is so versatile and trendy! Everyone needs to own a pair of black ripped denim and I am OBSESSING over my new mules... I am definitely late to the mule trend but I now pair them with everything! You guys know my style, sneakers go with pretty much all my outfits! I am obsessed with Adidas and I'm not afraid to show it! This new pair of white denim are my FAVE and you will be seeing a lot of these. They fit PERFECTLY and have the perfect amount of stretch, distress, crop and AHH I love these. I've paired them with a black bodysuit and a light denim jacket and this is one of my go-to outfits for this season! See? Told you you'd be seeing these jeans on repeat! Same jeans, totally different look! 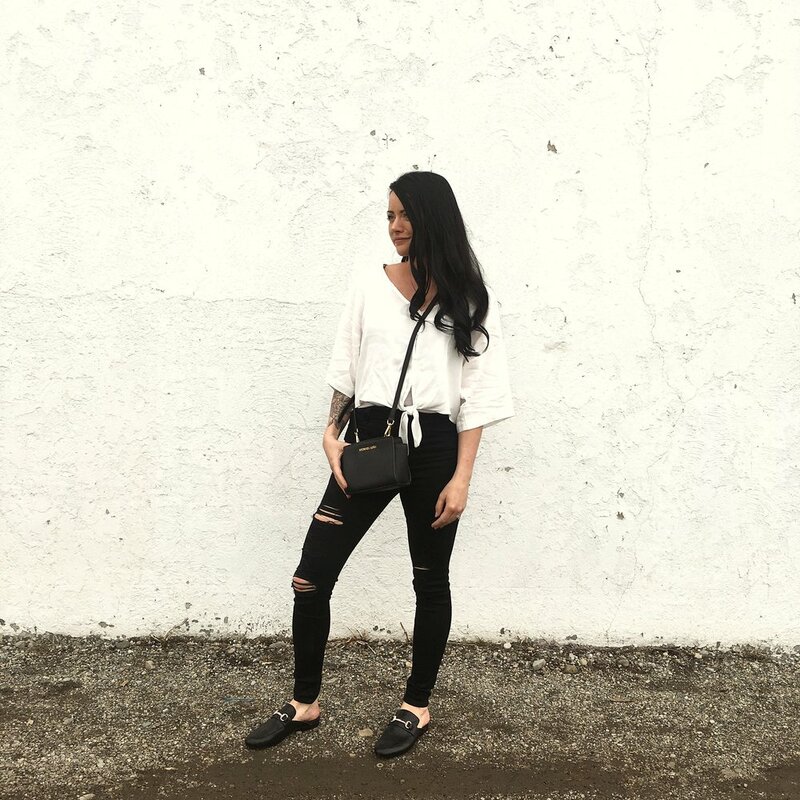 I tossed in some older pieces to give this an updated look, and you could totally swap the black denim for the white and make it SUPER springy! Judging by the amount of snow still on the ground, for now, we'll stick with black. Nothing new here, just a girl loving her sneakers and leather jacket! Definitely an outfit on repeat all year round. A little more of dressy option but so versatile and could be dressed up or down! Again the only new item is the shirt which completely changes the look but can also be an excellent item in a capsule wardrobe! Can you tell I'm excited to put that post together? Stay tuned!